Many restaurants use their specials board to move over stocked protein items. The protein could be raw or previously cooked. Generally, a menu item is developed to utilize the over stock. For example, leftover roast may be diced and added to chili or soup. Fresh fish may be offered as the "Catch of the Day" and featured at an attractive price. Many urban areas have charity organizations with the goal of reducing hunger among the homeless. They usually have trucks and will send a driver to pick up any donations. Some restaurants donate over stocked protein items which tend to lose flavor when frozen. Certainly, many over stocked fresh items find their way to the freezers. Both raw and cooked items are frequently frozen. Some food loses flavor and texture when frozen and thawed. You may consider purchasing items in a frozen state. Commercial flash freezing retains more of the qualities. My favorite uses of over supply is the stock pot in cold months and salads in warm months. We are now in summer. 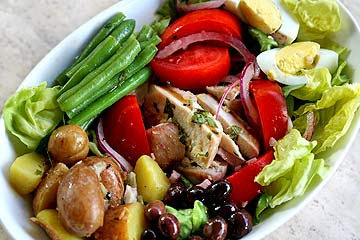 One of my clients serves a wonderful salad Nicoise using cold seared tuna. In addition to stocks and salads, you may be able to marinate some meats. Kabobs and BBQ often require several days in a marinade. Once your over supply of food spoils, the obvious destination is the nearest garbage bin. If the wasted food is disposed of in a heavy plastic garbage bag, it may eventually produce methane which is harmful to the environment. Compost piles may be an option if you are in the country. Some urban garden groups may be interested in your waste. Some fats and oils can be converted into a fuel which can be used in diesel engines. Accurate forecasts help reduce the management energy spent trying to make the most of over stocked items. In a perfect world, there would be very little left over each night. Improved forecasts will reduce waste. Good call - most important thing is that there is NOT an option for staff to take leftovers home. One of my college work study gigs was a job working the grill in the student union. Our manager would ask us to make a round of sandwiches about an hour before closing each night. Without fail, she would announce at the close: "Well we can't let these sandwiches go to waste!" We split the sandwiches equally and each of us left with a bag.